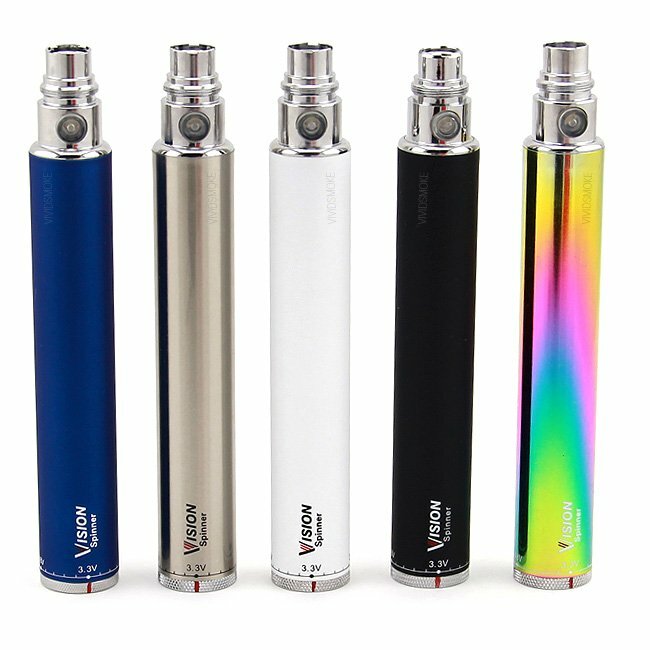 The Vision Spinner VV 1300mAh Battery makes for a simple and inexpensive way to just sit back and enjoy the pleasure of vaping. The Vision Spinner stands somewhere between an e-cig and a more advanced personal vaporizer due to its variable voltage dial that ranges from 3.3-4.8V. The dial is located at the base of the battery and has markings with incremental dashes to indicate the current voltage-output. Spinning the dial clockwise increases the voltage and vice versa, and pressing the fire button five times will power the device on. To turn the Vision Spinner off, simply click the firing button five times again. If you’re looking to get the best possible battery life out of this device, using a lower voltage (both when in-use and not in use) might significantly help extend the overall battery life. When the battery is low, simply charge it up through the universal micro USB port. A small LED light will indicate that the device is plugged in and will turn green once the battery is charged completely. Utilizing smart buck-boost technology, the Vision Spinner has short circuit protection, low voltage protection, and an 8 second safety cutoff that’ll automatically cut the power to the device after holding the fire button down for 8 seconds. Attach any compatible tank to the eGo 510 connection and experience the simple joy of vaping with the Vision Spinner VV 1300mAh.